It wouldn’t be a SHOT Show without new handguns to show off, and there are a bunch of them this year, at least that we heard about before this issue of W&G went to press. Some manufacturers embargo news of their new product introductions until almost of the annual trade show itself, and Sig Sauer is one of those companies. But Sig did report that the Army has issued the first of its new M17 and M18 (modular Handgun System, also known as MHS) to the 101st Airborne Division 1st Brigade Combat Team on Nov. 28 at Fort Campbell, Kentucky. The M17 full-sized pistol and the M18 compact version are variants of the P320 pistol, available in 9mm and 40 S&W. 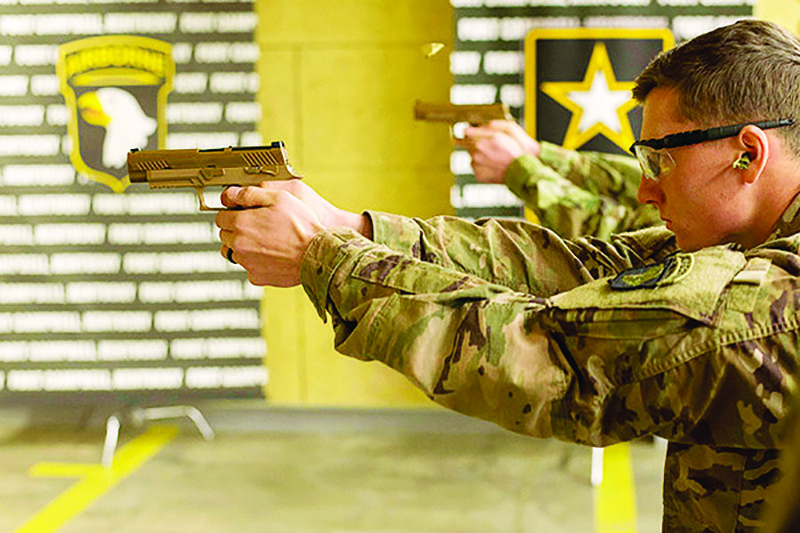 1st Airborne Division soldiers are the first unit issued M17 MHS pistols manufactured by Sig Sauer. Here then are some quick notes on the new pistols that W&G editors learned about before SHOT. Browning this year is introducing the Black Label 1911-380 Pro Stainless model in both Compact and Full Size configurations. There will be an accessory rail option. The Black Label has a matte black composite frame and machined 7075 aluminum sub frame and slide rails. It’s a looker with a stainless slide and satin silver finish on the barrel. Also from Browning is a new Buck Mark Plus Lite Flute model with a 5½-inch steel barrel inside an alloy sleeve, with fluting. It has a matte blue finish except for the flutes. And Browning has another .22-caliber pistol, the Buck Mark Camper UFX Suppressor Ready model with an all matte finish and threaded barrel to accept a suppressor. It’s got a TruGlo/marble Arms fiber optic front sight and Picatinny rail. This .36-caliber revolver was a favorite among Old West gunslingers, most notably James Butler “Wild Bill” Hickok, who frequently carried a pair of Model 1851 wheelguns. The replica is made by Pietta and is faithful to the original. The revolver features handsome laser engraving and has a 7½-inch octagonal barrel with traditional bead/post front sight, and checkered one-piece walnut grip. It features a case hardened old silver frame with a standard blue finish. According to Cimarron, it is also available in a .44-caliber version. New from Inland is the M30-P, based on the popular Inland full-size .30-caliber carbine platform. This one has a 12-inch barrel that is threaded at the muzzle for a suppressor, and it has a Gear Head Mod II Tail Hook arm brace at the other end. This new pistol comes with a single ten-round magazine and it has a Sage EBR aluminum chassis stock. Engraved Cimarron 51 Navy percussion pistol. A second entry from Inland is the M30-I.M.P. (for “Improved Motor Patrol”) pistol in .30 caliber with a 7 ½-inch barrel that is also threaded. It has M1-style sights, is 16 inches long overall, and has a special Sage aluminum pistol chassis with Ergo Sure Grip pistol grip. 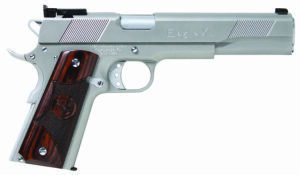 Iver Johnson has announced the Eagle XLC model, a long-slide 1911 pistol with a 6-inch barrel in 10mm or .45 ACP. 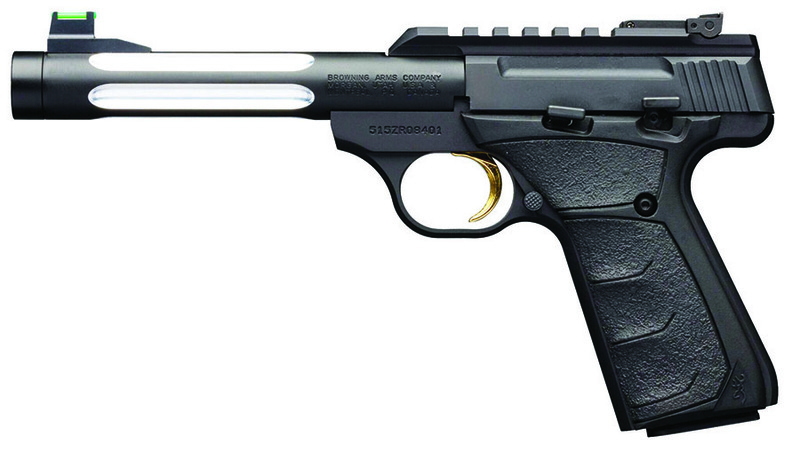 The pistol wears a satin chrome finish and has a 1045 steel frame and slide with a 4140 steel barrel. There are lots of features handgunners like, including a fully-adjustable white dot rear sight and dovetail front sight, beavertail grip safety with memory cut, lowered and flared ejection port, skeleton hammer and three-hole trigger, front and rear angled cocking serrations, beveled magwell and dual texture walnut grip panels. 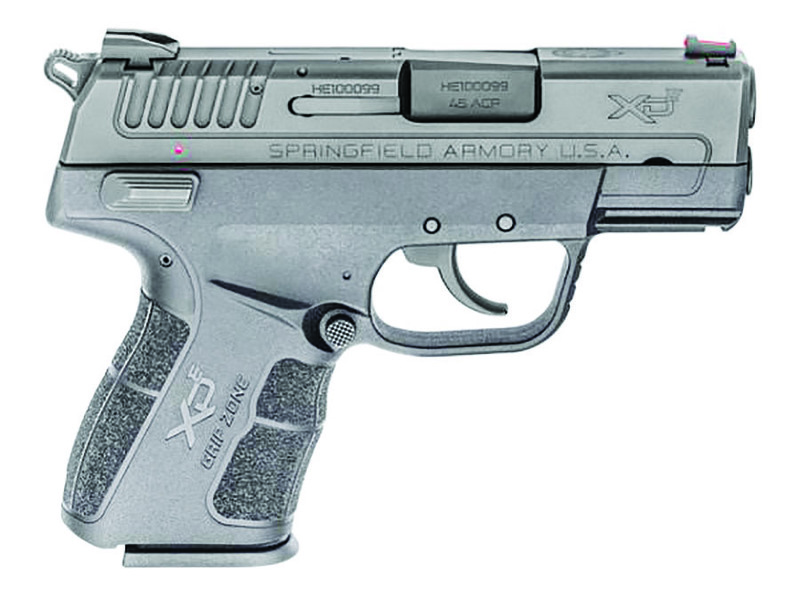 Springfield-Armory’s new XD-E polymer framed .45 ACP. It has an 8-round magazine and weighs 44 ounces unloaded—not a lightweight handgun. Ruger is launching a compact, all-stainless steel Ruger SP101® chambered in the powerful .327 Federal Magnum, which approximates the performance of .357 Magnum but allows an increase in capacity to six rounds in the cylinder. 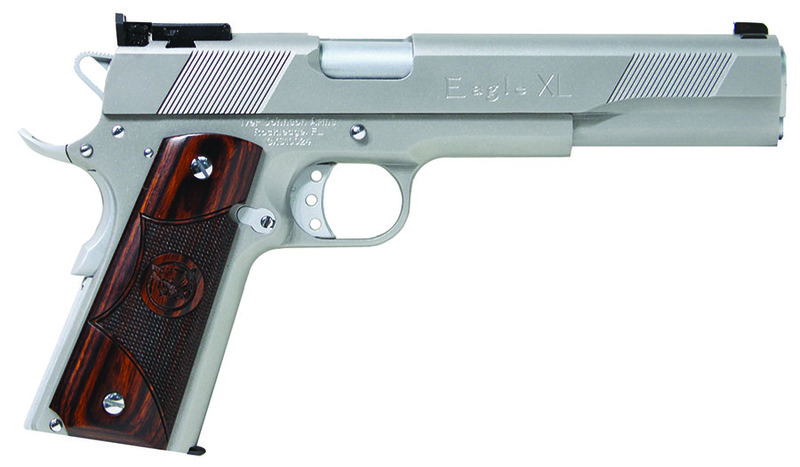 This model features a 3” barrel, fixed sights and a cushioned rubber grip with engraved wood grip panels. 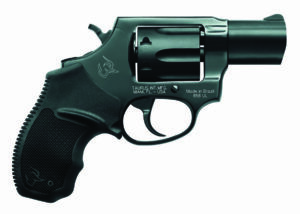 They are also introducing a seven-round version of the popular GP100®, chambered in .357 Magnum. These new model offerings are available in three popular barrel lengths – 2.50”, 4.20”, and 6” and feature one-piece rubber grips with hardwood inserts, adjustable rear sights and fiber optic front sights. 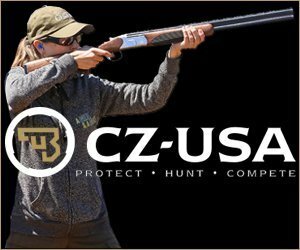 And Ruger is offering four new LCRx® configurations of the popular compact pistols chambered in 9mm Luger, .327 Federal Magnum, .22 Magnum as well as a 3” barrel version in .22 Magnum. All of these new additions to the LCRx® family feature an external hammer for single-action use and a Hogue® Tamer™ grip. 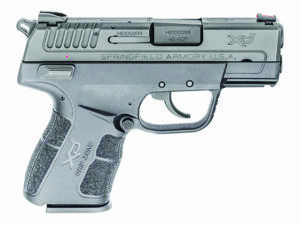 Late in 2017, Springfield Armory announced the .45 ACP version of the XD-E semi-auto pistol. 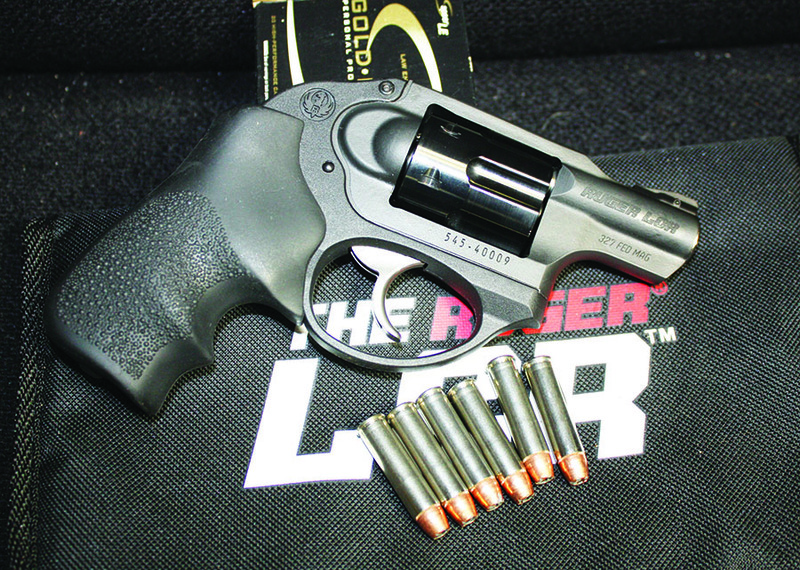 Ruger Light Compact Revolver chambered for the .327 Federal Magnum. Like the 9mm version, this one has a polymer frame, dual recoil spring with full length guide rod, exposed hammer, ambidextrous manual safety/decocker, 3.3-inch hammer-forged barrel and fiber optic front sight. Weighing 23 ounces, it comes with six- and seven-round magazines. Taurus will be spotlighting the new 1911 Commander and Officer model pistols, the Raging Hunter revolver and two other wheelguns, the Model 692 in .357 Magnum and the Model 856, a .38 Special snubby. Taurus .38 snubby in satin black with cushioned grips. The two new 1911 clones will work well for armed citizens. Chambered in .45 ACP, the Commander model has a 4.2-inch barrel, front and rear cocking serrations, carbon steel construction, Novak drift-adjustable sights, beavertail grip safety with bump and matte finish. The Commander sized gun has an 8-round magazine and the Officer’s version has a six-round magazine. The Raging Hunter is a mammoth sixgun chambered for the .44 Magnum, with a rail on top of the heavy barrel for a scope or some other sight, soft rubber grip, adjustable rear sight and blade front sight. The barrel is ported. The Model 692 has an unfluted cylinder with seven chambers, a stainless or blue finish, Ribber grip, ported barrel available in either 3- or 6 ½-inch lengths, adjustable rear sight and ramp front sight and most important of all, it comes with a second cylinder for 9mm ammunition. For concealed carry, the Model 856 in .38 Special has an exposed hammer, six-round capacity, blue or stainless finish, soft rubber grips, and is +P capable.